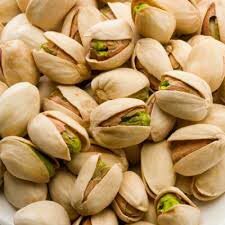 We bring forth premium Roasted Pistachio Nuts. Lightly salted, the Roasted Pistachios are excellent snacks to serve on all occasions. These nuts are rich in dietary fiber, vitamin B-6, thiamin, phosphorus and copper. Also, they contain phytosterols, which are directly associated with lowering cholesterol levels. Roasted Pistachio Nuts are made available in quality packaging of different sizes to suit all the requirements of our customers. Also, they are reasonably priced. As trusted Roasted Pistachio Nuts Exporters, we ensure that the orders for Roasted Salted Pistachio Nuts reach the customers on time and in the best conditions. We have hi-tech facilities where these nuts are processed and all traces of contaminants are removed. The premium grade Pistachio Nuts are sourced from best vendors with an impeccable track record.